Haven't seen a topic for this yet. I'll try and give some more in depth views on it when I get the chance to do a short write up on it. It's the follow up to the Oberkorn and is designed to make it easy to add variety to sequences and be tweaked live. I took a 3 note short sequence and built it up and evolved it by adding percussion, transposition, adjusting the loop lenght and adding whats called Intensity. Which is a Cv input that triggers random gates as the sequence plays. Looks tasty and I can well see one in my future. Tom's stuff is great - and built properly too - and it's nice to see what he comes up with. Cool. It kind of fell into my lap while I was buying some other stuff from Tom. It was shown in prototype from in Superbooth and is just about to go on full release. It's built really well and really intuitive to use. You could more or less just plug it in and get going right away without a glance at the manual and it goes perfectly with the Oberkorn. I really like the flipped gate features were you can connect 2 synths to the sequencer and when you turn off the gate for one it turns it on for the other. Makes for nice variation in both the pattern and the sound. I used the Generator for the percussion in this sequencing 2 Nyborg 24s and modulating their filter. Bass is from a Fusebox sequenced by a Mega City, filter modulated by an Oberkorn and Transposed by a Telemark K.
Additional percussion from 3 Telemarks sequenced by 3 Oberkorns. All recorded with no effects or post mixing. Spent a load of time at the weekend playing about with the Generator with the intention to create a full song in just hardware sequencers. Took a while with having to create the various sequences and dial in the notes and check the tuning etc. The Generator does 3 different sequences in the video, each then recorded. The mega city is sequencing a Nyborg 24 for arps. And the bass is a Nyborg 24 that I got a chord like sound out of by having the Oscillators and Sub in 3 slightly different states of tune. 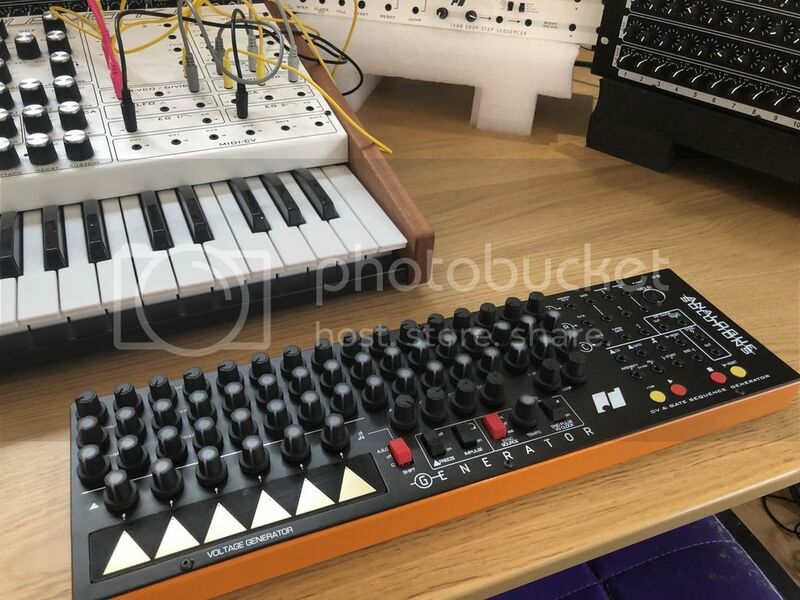 Yeah it's a hard thing to pick from, I like one synth challenges though as it's a good way to learn an instrument and find ways's to coax different sounds out of it and to get inspiration for future tunes. The Nyborg is very versatile. Chevytraveller has one (two?) and it's a stonking box. Just by fiddling, I got an almost perfect DX7 fm bass sound. Wow. He did a track using just that in the last synth challenge so have a read of the old thread and see his entry. I'm sure that there also used to be a youTube vid but I can't find it at the moment. Dave B wrote: The Nyborg is very versatile. Chevytraveller has one (two?) and it's a stonking box. Just by fiddling, I got an almost perfect DX7 fm bass sound. Wow. He did a track using just that in the last synth challenge so have a read of the old thread and see his entry. I'm sure that there also used to be a youTube vid but I can't find it at the moment. I'll look that up now thanks, love seeing what people do with them. Great track that. But then pretty much the whole Chorus album sounds fantastic. Yeah, Home doesn't get a lot of recognition but is one of their best, to me anyway. Made use of the Daisy chaining features of the Generator for 32 steps and the Voltage Generator Transposition in this Sequencer cliche classic. Sequenced by 2 Generators. Treadstone Bass, Fusebox Lead, Telemark percussion plus some additional percussion from Logic. Generator is sequencing the Arp the rest was played in as an audio recording (no midi) using the Telemark Keys. Percussion is from Logic.